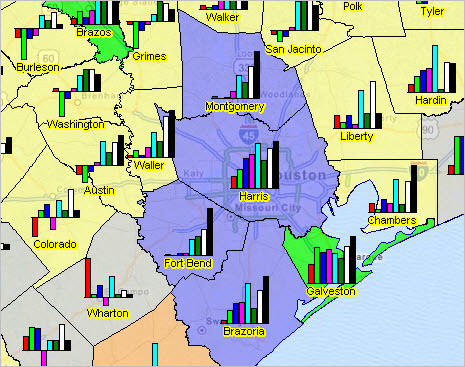 Harris County, Texas (Houston area) increased in population from 115,693 in 1910 to 4,092,459 in 2010. See how the county population changed, decade by decade, using the interactive table in the related Web section. How have your counties of interest changed in population since 2000? during the past century? Find out … key in a county name of interest using the interactive table shown in this section. In the 1930s, 1940s, and 1950s, much of eastern Texas population declined (pink shaded counties). Those areas have seen strong population growth since then (green shaded counties). See map graphics for each decade in related Web section. Graphic shows counties ranked in descending order on rightmost column. Graphic shows counties ranked in ascending order on rightmost column. 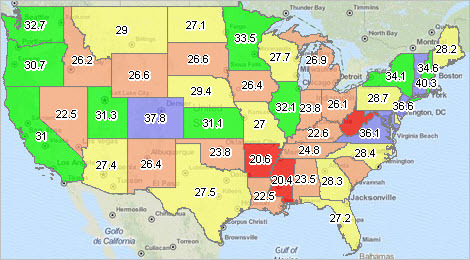 Use interactive table in related Web section to select/rank by state; choose alternative decade. Using the interactive table compute the population for any decennial census date by starting with the Census 2010 population and subtracting gains and adding losses. Example. Copy the Harris County, TX row to clipboard. Paste into cell A1 of an Excel spreadsheet. Set cell O2 to D2-SUM(E2:N2). The computed total population for Harris County, TX as of the 1910 Census is 115,693. • County population 1790 to 1990 by decade (xls) — requires User Group ID. In 2013, the state median age ranged from 30.2 (Utah) to 44.0 (Maine). The percent population 25 years and over who are college graduates ranged from 18.8% (West Virginia) to 55.1% (District of Columbia). Median household income ranged from $37,963 (Mississippi) to $72,483 (Maryland). 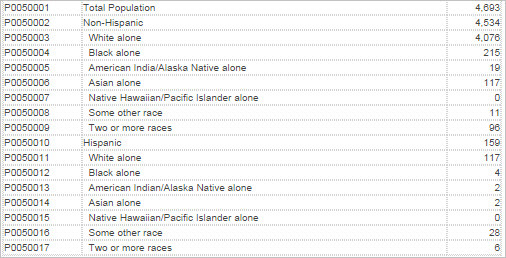 These data are examples of data from the “Demographic State of the States 2013” reviewed here and covered in more detail in this Web section. Use the interactive table in the related Web section to examine selected demographic characteristics of the U.S. and states based 2013 American Community Survey (ACS 2013) 1-year estimates. Query, rank, compare on selected demographic-economic subject matter items. The data in the table, and the table itself, were developed using data access tools available on the ACS 2013 API interactive table. These 2013 data are the most recent estimates (released Septermber 2014) and update with 2014 estimates to be released in the fall 2015. Use the interactive table to create ranking such as the one shown below. The righmost column is sorted in descending order based on percent college graduates (of the population 25 years and over). … 4 clicks away from a demographic profile for your selected area … the American Community Survey (ACS) 2013 1 year estimates provide the most current demographic-economic data for wide-ranging geography having population 65,000 and over. These geographies include the U.S., regions, divisions, states, counties, county subdivisions, cities/places, native american areas, metros, congressional districts, school districts, public use microdata areas, among others. These data provide a unique and rich set of data resources for decision-making. They provides analysts and stakeholders with current information they need to plan investments and services. Retailers, homebuilders, police departments, school districts, and town/city planners are among the many private- and public-sector decision makers who count on these annual results. 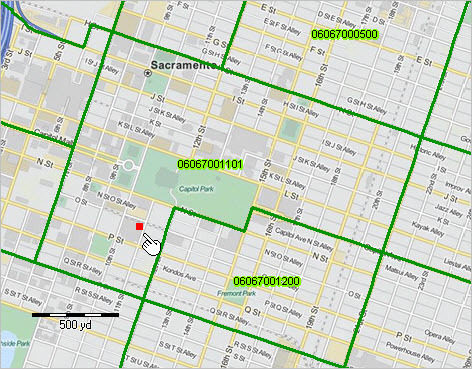 These data can be made more powerful by integrating them with other data and visually/geospatially analyzing patterns with GIS and modeling tools. The following steps illustrate how you can access data for areas of interest. We use the example of Scottsdale, AZ. 1 – view the table ACS2013. 2 – below the table, replace San Diego with Scottsdale. 3 – click the Find in Name button to the left of Scottsdale. 4 – table refreshes; click get data link in Scottsdale city row. Optionally import the displayed data into a spreadsheet. Retrieve data for other areas of interest and easily compare attributes for multiple areas. See details on the main web page — http://proximityone.com/acs2013.htm. 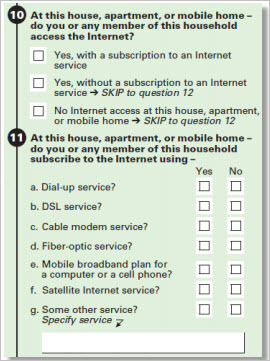 .. new data resources on computer and Internet usage .. mandated by the 2008 Broadband Data Improvement Act, questions on computer and Internet usage are included in the American Community Survey 2013 for the first time. Initially computer and Internet usage data will be available from the ACS 2013 1-year estimates (September 2014). These estimates are available for areas 65,000 population and over — the September 2014 data are tabulated for the U.S. and all states, metropolitan statistical areas (MSAs), Public Use Microdata Areas (PUMAs), and 113th Congressional Districts as well as large cities, counties and school districts. See related Web section for more detail. The Federal Communications Commission (FCC) will use these data to measure the nationwide development of broadband access, as well as the successful deployment of the next generation of broadband technology. The data will also enable the FCC to develop measures to increase access to broadband technology and decrease barriers. The National Telecommunications and Information Administration (NTIA) will use the data to provide grants that help expand public access to broadband service and fund broadband education and support, particularly to groups that have traditionally underutilized broadband technology. State and local governments can use the data to evaluate access to broadband in their communities, and institute policies and programs that increase access to areas with less connectivity. Businesses, investors and other organizations can use the data to analyze computer and Internet usage in their markets and communities. Knowing how many people have access to computers and the Internet helps these groups communicate more effectively with their customers and plan outreach, infrastructure development, ecommerce and more. University researchers and other analysts have a wide range of new ways to examine the how, who and where of computer and Internet usage. There are many new summary statistic tables based on the new questions. 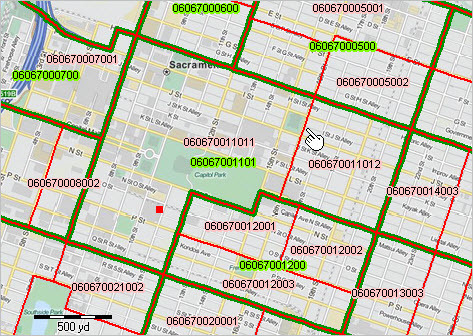 Related items are included in the Public Use Microdata Sample files and create many new possibilities to develop custom estimates of computer & Internet usage crossed by other population and housing attributes. The report Computer and Internet Use (May 2013) provides household and individual level analysis of computer usage and Internet use. 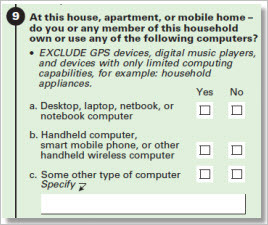 The report is based on data collected in a July 2011 supplement to the Current Population Survey (CPS), which includes questions about computer ownership, Internet use both inside and outside the home, and the additional devices that people use to go online. The U.S. Census Bureau has asked questions in the CPS about computer use since 1984 and Internet use since 1997. The report provides limited scope state-level data and no sub-state data. Geography, and geographic data, play an indispensable role in the development and use of decision-making information. Almost all business, demographic and economic data relate to location(s) or area(s). The Census Bureau TIGER/Line data, predominately made available for public use as shapefiles, are equally or more valuable than the Census Bureau demographic-economic data. These geographic data are the source for almost all online map services now in existence. The Census Bureau releases thousands of public use shapefiles annually that reflect changing geography — changes to political and statistical boundaries and changes to roads and earth surface geographic attributes. 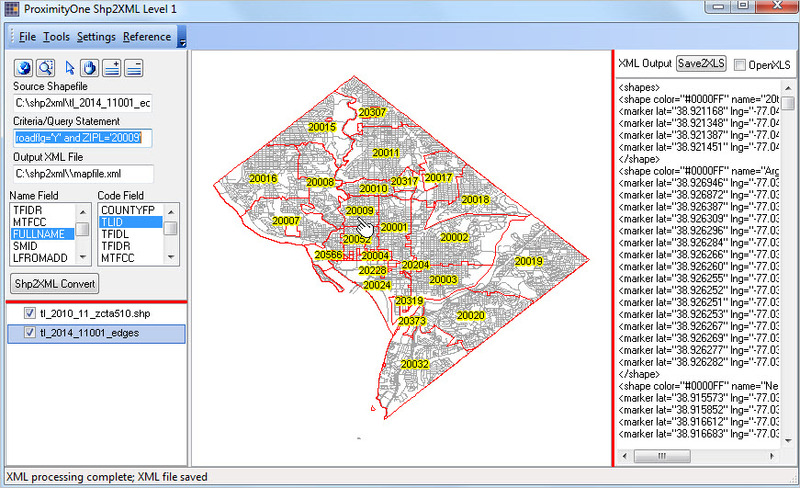 Use the Shp2XML software to extract shapefile geometry and output those data to XML-structured file. 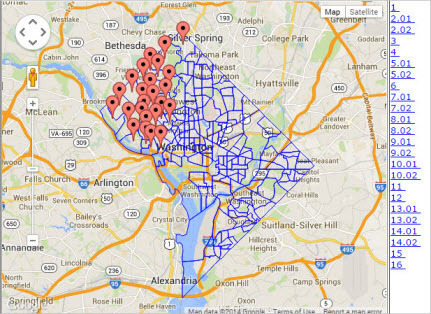 Integrate the shapefile geometry into a Google Maps API application. Click graphic to view as dynamic Google map. Shapefiles do not contain the geometry coordinates in the shapefile DBF. The geometry coordinates (e.g., latitude and longitude of vertices) are not directly viewable or extractable without specialized software. 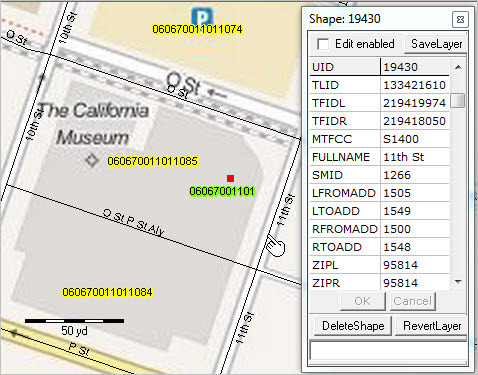 Many applications require coordinates only available in shapefiles. For example, an XML file with coordinates can be used as a polyline or marker file with Bing or Google maps. 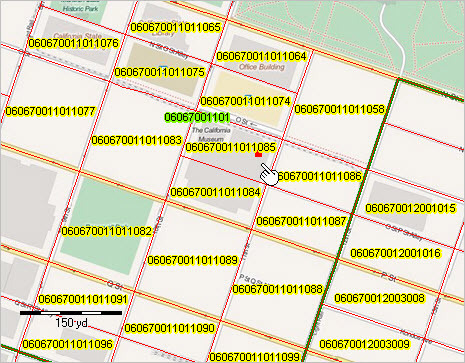 The coordinates list can be processed by wide-ranging geospatial applications. Use the Shp2XML software to extract shapefile geometry and output those data to XML-structured file. 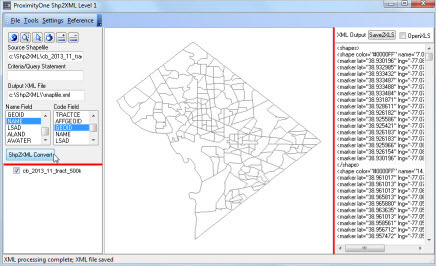 Shp2XML generates an XML file (text file) that contains the coordinates of the each shape in the user selected shapefile (or a subset of shapes in the shapefile if a query is applied). Optionally save the XML file in XLS format. User controls and legend panel are shown to the left of the map view panel. The XML file generated is shown to the right of the map view. 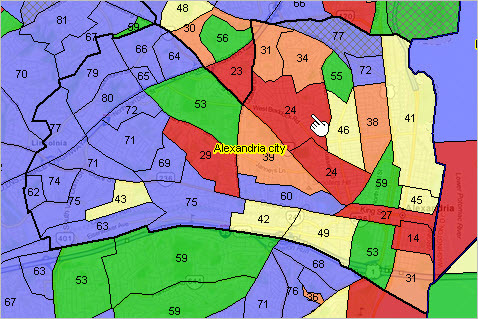 The following view shows Washington, DC by ZIP Code area (ZCTA) and all roads/edges shapefiles as layers. The view uses the shapefile ZCTA shapefile (cb_2013_11_tract_500k.shp) and the EDGES shapefile (tl_2010_11_zcta510.shp) both included with the installer. • Use File>Open Shapefile to open the ZCTA shapefile. 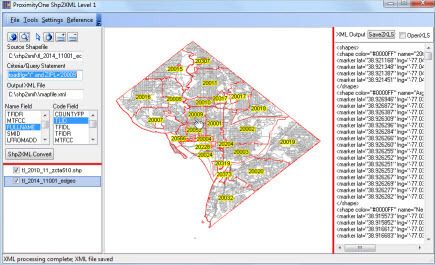 • Use Add Shapefile (+ button at top of left panel) to add the EDGES shapefile. • Modify attributes of the ZCTA layer to set as transparent/red boundary with ZIP Code as label. • Add the query “roadflg=’Y’ and ZIPL=’20010′” (this results in only meeting roads this criteria to be exported. • Select a field to be used as NAME (NAME) and field to be used as CODE (TLID) using list boxes. • Click the Shp2Xml Convert button. Shp2XML Level 1 is available at no fee to members of the ProximityOne User Group (no fee, join now). See more information about installing and using Shp2XML. 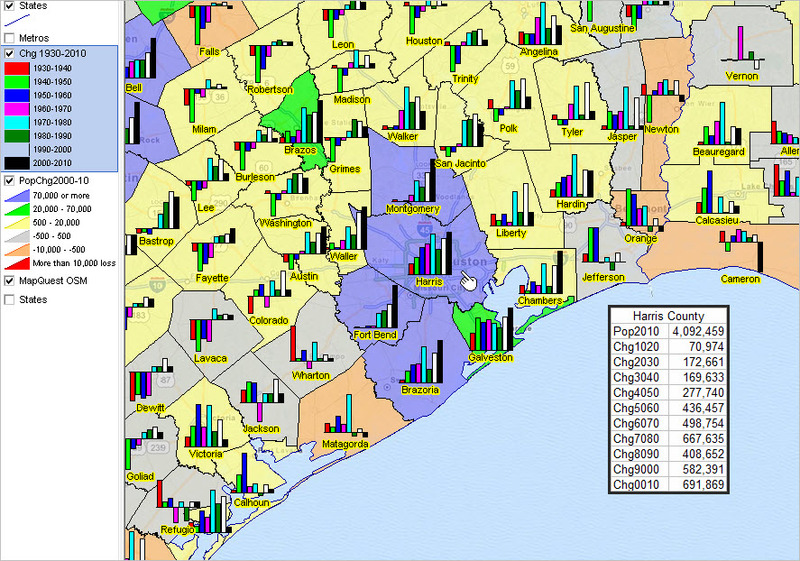 Census tracts, block groups and blocks are the important small area statistical geographic areas for which data from Census 2010 are tabulated. Data for census tracts and block groups are now tabulated annually from the American Community Survey. For example. in December 2014, we will have new “richer demographics” annual estimates centric to each year 2008 through 2011 for Census 2010 tracts and block groups … data such as educational attainment, median household income and median housing value.